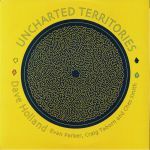 Review: Uncharted Territories is a three LP studio album by English jazz bassist Dave Holland, together with saxophonist Evan Parker, percussionist Ches Smith and pianist Craig Taborn. Avant-garde jazz for the most part, they present a series of deep, multi-layered conversations between one another - some of whom were collaborating for the first time. The origin of these new, free improvisation sessions goes back to Holland's pre-New York days and his association with Parker - when they played together in Spontaneous Music Ensemble.